A Saturday night football match in Diyarbakir between Bursaspor and Diyarbakirspor again resulted in chaos when Diyarbakirspor fans began hurling objects at Bursaspor players. Police used teargas to disburse some Diyarbakirspor fans rioting outside the stadium. 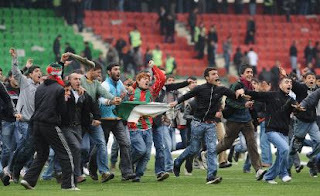 On Sept. 26, another match between the teams -- also in Bursa-- resulted in violence following the actions of some ultranationalist Bursaspor fans. UPDATE I (3/9) -- Diyarbakirspor is asking the Turkish Football Federation (TFF) for a re-play of Saturday's game, arguing they should not be blamed for the actions of fans and citing the provocation of Bursaspor fans during the earlier game as the proximate cause of Saturday's disturbance. According to Hurriyet Daily News, the TFF is expected to announce a 3-0 victory for Bursa and order Diyarbakirspor to play at least three games behind closed doors. The decision will be announced Thursday.